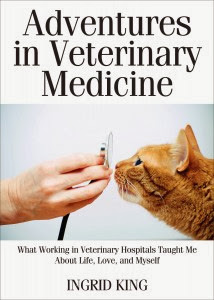 It is an honor to present to you the latest book by author Ingrid King, Adventures in Veterinary Medicine. I am a believer in synchronicity, and the quote, "life is what happens to you while you're busy making other plans. ", as well as listening to your gut and your heart. The path you are meant to take in life will often be clearly revealed to you, IF YOU LISTEN. Adventures in Veterinary Medicine by author Ingrid King, is a heartfelt, true story of how a former computer manual translator , and later an executive for a financial services corporation, discovered her life's passion/calling as a result of having to spend an inordinate amount of time at various veterinary hospitals treating her first cat and "soul kitty", Feebee for bladder stones. There are people who would love a high profile position in corporate America and would thrive, but to Ingrid, regardless of her stellar performance of the tasks required of her in those early positions, she felt a void. 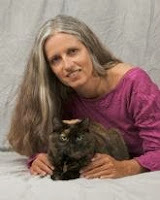 The speed bumps of life (a divorce and the heartbreaking passing of her beloved mother), helped pave the way for Ingrid's true calling, working with and writing about pets (primarily cats). From Ingrid King: Adventures in Veterinary Medicine is a "collection of essays" , many of which are about special cats and dogs that touched my heart to heroic veterinarians and staff who are in the business of saving lives every single day." As "dirty" as these tasks were, Ingrid "was in heaven." She had "found her bliss." Those early volunteer days paved the way for what would be a twelve-year journey. No two days would be alike. Ingrid also conveys through her touching essays, that those that work in veterinary clinics are often brought to tears by the animals in their care and are deeply affected by them, often more than we could possibly imagine. A cat named "Beast", a brown -and -white tabby with a long rap sheet. It was Ingrid, and her soothing aura and voice, who was able to get through to this gentle giant like no one before her could. Her affect on Beast was so profound, that he rubbed his face against Ingrid's and would "hug" her shoulders with his paws. From Adventures in Veterinary Medicine: "things aren't always what they seem. A fractious, aggressive cat may simply be starved for attention. A big, intimidating tom with a name that is meant to inspire fear may be, in reality, a great big teddy bear." Virginia, "the poster child for "tortitude" (tortoiseshell cats), who served as Ingrid's introduction to this wonderful breed and would be the catalyst for her love affair with torties. Little did she realize at the time how tortoiseshell cats would be changing her life. Jake the handsome young vet who Ingrid developed a crush on. This essay particularly delighted me because anyone who knows Ingrid, knows that she keeps the majority of her life private, and this essay offers us a glimpse into the giddy, smitten "school girl" side of this amazing woman while making us laugh when Ingrid reveals that she "was so dazzled by his good looks, caring and compassionate manner, and veterinary skills, that I overlooked one minor detail: Jake was gay." There are also essays on Kennel Work, Finding a New Vet and Life After Veterinary Medicine. For those familiar with Ingrid's previous books: Buckley's Story-Lessons from a Feline Master Teacher and Purrs of Wisdom:Conscious Living Feline Style, (to read my reviews of both of these marvelous books click here to be re-directed to my book review page), Adventures in Veterinary Medicine is a welcome addition to this impressive collection, and is a "must-read" for those that believe, as Ingrid does, and I do, that sometimes you CAN "find your bliss in unexpected places." In full disclosure: those who know me and my reviews, know that I normally do NOT review digital books. An exception was made when Ingrid King contacted me asking if I would review her latest book and offered to mail me the manuscript (which I could hold in my "paws" and turn the pages like a "normal" book). I am delighted and honored to have been sent the manuscript. None of this had an affect on my opinion of Adventures in Veterinary Medicine. All opinions are my own. What a wonderful review. I have this book on my Kindle (as I do each of Ingrid's books) and cannot wait to read it. She and The Conscious Cat are extra special to me because of our mutual affinity for torties. So excited to read about Virginia and all the other essays. I bet this is a really awesome book - my human knows Ingrid and we have read both her other books, so I can imagine how excellent it is. Ingrid is an excellent writer and certainly knows her subject matter when it comes to cat health! What a wonderful review ! I would so love to read this book. I have read Ingrid previous two books (and blog) and liked them all. Buckley's Story is my favorite. Sounds like a very interesting and informative read. Have a marvellous Monday. Sounds like a great book! And thank you for your nice comment the other day - we know what it's like being in an apartment with cats. When we were in Rome, we were in an apartment on the fourth floor and couldn't let the cats on the balcony because one is very unsteady and it didn't seem fair to only let the other two out. So now that we are here with all the chipmunks, we are making it up to them! Have a great day! Nice review, Caren! It sounds like a great book. I don't really like electronic books as much as real ones though due to the eye strain reading off a screen gives me. Do you know if she's going to come out with a print copy of the book? Unfortunately, there are no plans at this time to come out with a print version of this book - and I so appreciate that Caren made an exception by reviewing my book despite her dislike of ebooks, and the fact that it's not available in print! I'm an idiot! I got this book when it was free on Amazon and didn't even realize it was written by someone I know! I just got it cuz it looked interesting. Haven't read it yet, but now it's going to the top of the to read list. It is a really good book. we have read it and it enjoyed it a lot. Very well written. Great review. A beautiful review, Caren...for what I'm sure is a beautiful book. Have not figured out the electronic book thing for myself yet. But when I do, I'll be sure to download Ingrid's book. She's such a talented and compassionate writer. What a great review! Mes would LOVES to reads it, it sounds real interesting. BTW, Cody, mes has a great award for yous on my blog today. Wonderful review. I have this in my TRP. Must move it up to the top. The mom downloaded this book to her kindle when Miss Ingrid offered it for free. But she hasn't read it yet. Now she can't wait to read it! Thank you so much for this wonderful review, Caren. Your support of my writing means so very much to me. you are most welcome Ingrid! It is my pleasure and I LOVE your writing! Wow, that sounds like a fantastic book! We will be looking into it in the future for sure.